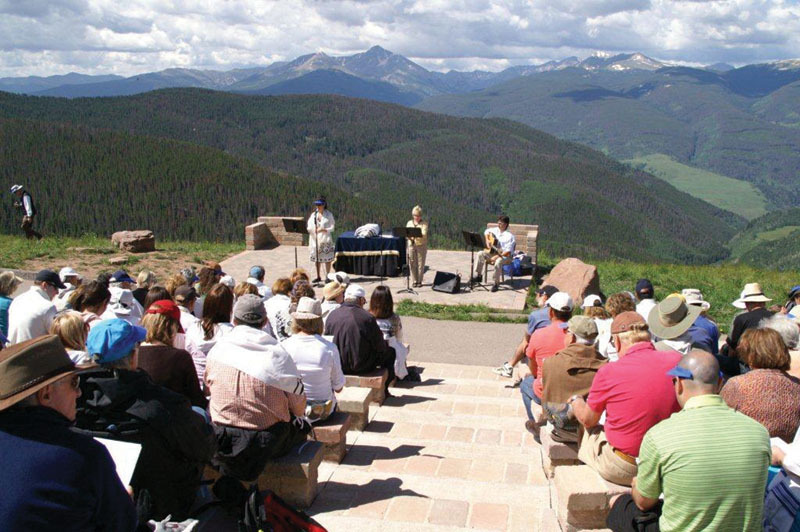 Special to the DailyBnai Vail hosts a Jewish worship service at the top of Vail Mountain a couple of times per year. The Interfaith community shares space in the Vail Chapel and each congregation also has at least one chance each summer to host an on-mountain service. VAIL, Colorado – On any given Sunday at both the Vail or Beaver Creek Interfaith Chapels, pastors can be seen setting up services for as many as 350 people in as little as eight minutes. Father Brooks Keith, of the Episcopal Church of the Transfiguration, has done just that and it’s just one of the many reasons he loves being a part of the valley’s interfaith community. The interfaith community was born in the very early days of Vail, said Don Simonton, who was a minister for the earliest Prostestant services held in Vail. Simonton now serves as treasurer of the Vail Religious Foundation, and is the director of the building committee for the new interfaith chapel being built in Edwards. The new chapel will house four congregations. Vail Associates presented the early congregations with a proposal to build a single church on land the ski company would donate to them, so that’s what they did, Simonton said. The groundbreaking for the Vail Chapel happened in the summer of 1968, and the building was finished and dedicated in the fall of 1969, he said. That’s the site of the Vail Interfaith Chapel today. The Vail Religious Foundation was already operating at the time, but there wasn’t much money to build the chapel, Simonton said. Everyone put their heads together and found the right people to help contribute. Many of Vail’s second-home owners from Denver pitched in, too. They just felt Vail ought to have a church building, Simonton said. Simonton remembers showing one man the progress on the church building, although there was still a fair amount of work that remained to be finished. The man asked Simonton what it would take to complete the project, and put the money in the bank the next day. Simonton said the amount of money wasn’t huge, but that it was significant enough to get the building finished and prevent the foundation from incurring any debt on the project. Evelyn Rosen, of B’nai Vail, said members have tried to find other interfaith communities around the country, and have only been able to track down two that operate outside of a military facility, prison or college campus. “It’s pretty rare that we’d have this in the Vail Valley,” Rosen said. The Jewish congregation joined the interfaith community in the 1970s, and began using the chapel a lot more around the early 1990s, said Myrna Sigman, who sits on the board of directors for B’nai Vail. Sigman has been president of B’nail Vail and been involved in the congregation heavily since she moved here in 1994, she said. “It’s grown from that point to where we are today, with 65 kids in our Hebrew school and we may hit 200 families (in the congregation),” Sigman said. The congregations, which include Catholic, Episcopal, Jewish, Lutheran, Presbyterian, Baptist and Roman Catholic, have always had an excellent bond, Sigman said. Simonton said at one time there were seven different congregations using the chapel. Father Brooks Keith, of the Episcopal Church of the Transfiguration, said the collaboration really started out of necessity, but it has evolved into what he calls affinity. Keith said the efficiency of the chapels and the interfaith community is amazing. Many churches or congregations sit empty 60 percent to 70 percent of the time, but the interfaith facilities in the valley are used about 70 percent of the week during the waking hours, he said. “So I can dedicate more to serving the community than worrying about bricks and mortar,” Keith said. Rabbi Debra Rappaport, of B’nai Vail, said she was so impressed with how truly interfaith the partnership is. The chapels feel like holy spaces, but there aren’t particular religious symbols that might put anyone off from a particular faith, she said. Community Editor Lauren Glendenning can be reached at lglendenning@vaildaily.com.